The fungus-growing termites of Odontotermes are well known for their ability to build diverse and complex mounds. It is important for termites to build mounds with proper structures or to actively manage water to maintain a suitable water content inside the mound and then generate an appropriate microclimate. However, the mechanisms by which termites regulate the water content inside the termite mounds are currently unknown in regions in southern Asia with distinctive dry and wet seasons. Researchers from Xishuangbanna Tropical Botanical Garden (XTBG) conducted a study to investigate the spatio-temporal variations in the water content in the mound structures of O. yunnanensis. They used the dye tracer infiltration method to determine how the existing mound structure and/or termite activities contribute to regulating the moisture inside the mounds. 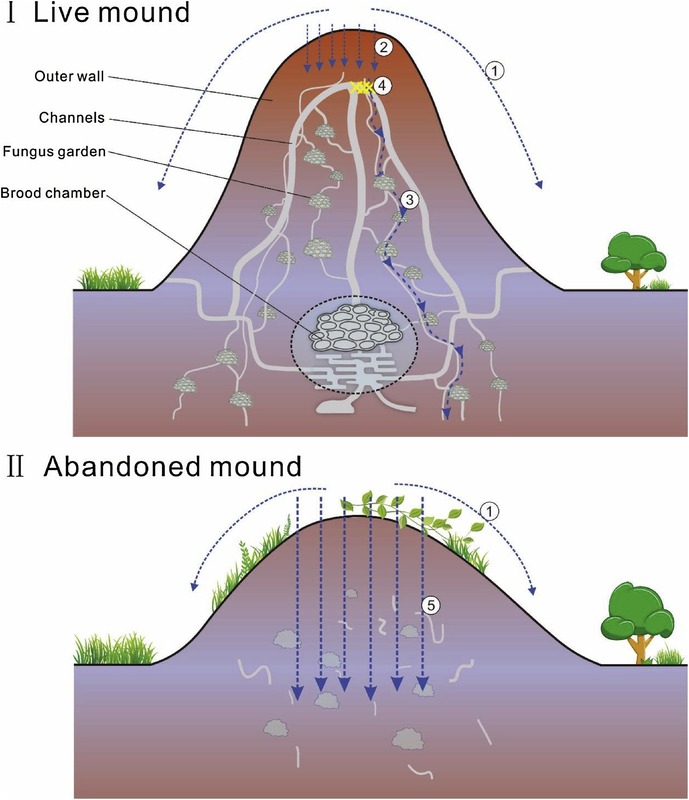 Their experimental results first demonstrated that termites could keep the moisture levels within a tolerable range inside mounds by regulating the existing mound structures and termite activities. In the rainy season, the compacted outer walls prevented water infiltration into the mound, and the specified tunnels eliminated excess water when the outer walls were compromised. In addition, the termites could repair or reshape the mound to control water flows inside the mound to ensure the stability of the water in the internal environment. During the dry season, a massive water-gathering system depended on termites acting as vertical conveyors of soil and water and decreasing evaporation inside the mound. “Our results strongly support the hypothesis that mound structures and termite activities remarkably influence water distribution, water flow, water infiltration and water transportation outside and inside the mound.”, said Prof. LIU Wenjie, principal investigator of the study. Schematic diagram illustrating the mechanisms of water regulation in the live mounds (Ⅰ), and the water characteristics in the abandoned mound (Ⅱ).